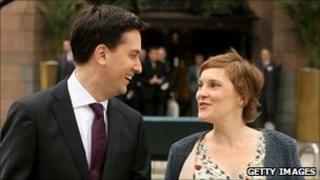 New Labour leader Ed Miliband has said he will get married, but political events have so far "got in the way". The Copenhagen climate change summit and the general and leadership elections had prevented him and partner Justine Thornton setting a date, he said. Mr Miliband said marriage was "a very important institution", but was not a pre-requisite for a stable family. The couple are expecting their second child in November. Ms Thornton was in the front row for Mr Miliband's keynote speech to the Labour conference on Tuesday. Although he did not mention his partner during the address, as recent Labour leaders including Gordon Brown have done, he did refer to their one-year-old son Daniel. During a round of media interviews on Wednesday morning, the new leader was asked several times about his marital status. He told Sky: "I have said that we will get married. I said that Copenhagen and the general election and the leadership election got in the way. "We will get married, but I think it's important, and I feel this quite strongly, that politicians should be able to make their own decisions about their lives." Speaking to BBC Breakfast, Mr Miliband said: "I think marriage is a very important institution, but there are stable families that aren't married and stable families that are married. "My love for Justine is profound and we're a very close unit, and we're very much looking forward to the birth of our second child." Asked whether he felt being married would be important if he were to become prime minister, he said: "I think people are pretty relaxed about this. Media captionEd Miliband: "I think people are pretty relaxed (about marital status)"
"I don't think people care one way or the other about what other people do in their lives as long as they show responsibility to each other." The new Labour leader was even offered the opportunity to propose to Ms Thornton live on ITV's Daybreak programme, but declined. "I think it's better to do it in person, really," he said. "I don't think it would exactly bring out my romantic side to propose on Daybreak, but thanks for the offer anyway." Mr Miliband is not named on the birth certificate of the couple's first child - something he admitted he was "really embarrassed" about - but he said he would make sure not to miss out a second time.